I recently encountered this dectuplet as you can see in the picture attached. To me this doesn't make sense. This makes 10 16th notes instead of 4. This reduces the notes' lentgh 2.5 times. Should one not write this as 10 32th notes instead of 8? That would make more sense to me. 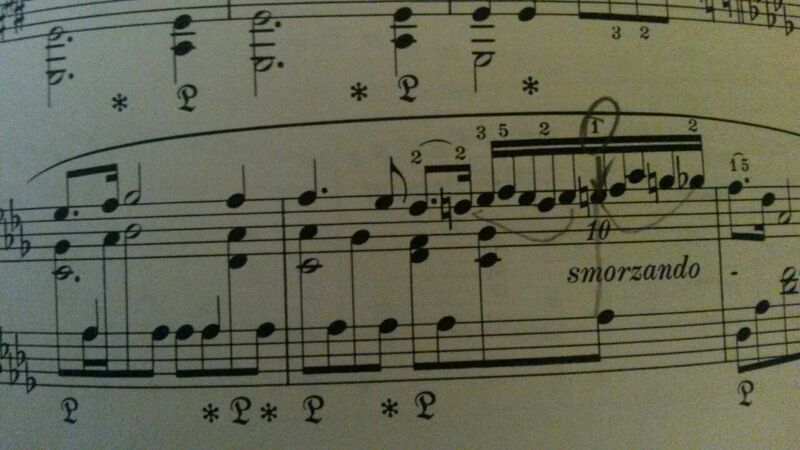 Then the notes' length would only be reduced 1.25 times. Or better even: two quintuplets of 32th notes. Theoretically, you're right, I think. Strictly, the example you show should be read as "play these 10 notes with the same duration that 8 normal 16th notes would have", i.e., the total duration of a half note, which does not fit the meter. This may be a typesetting mistake, or a simplification for readability (a lot of beam lines in this case don't give a lot of useful information and clutter the score). I'm not saying it's right, but it's quite clear in this presentation what you're supposed to do. BTW, looking at the pencil markings, it should be noted that the composer (if that's what the composer actually wrote) chose to write a dectuplet and not two qintuplets. That division may be useful when learning the piece, but care must be taken that the 10 notes sound as a continous fluid phrase, not as two separate phrases. This isn't going to be played with mathematical precision. Along with the "smorzando", the choice of note value indicates a relaxed tempo related to the preceding 16th note, rather than something twice as fast. As you say, there is plenty of information in the rest of the notation. In the fourth bar of the same Chopin prelude you also find something equally suspicious from the point of view of modern notation practice. There it's seven notes written with a single beam even though their duration is just a quarter note. You'd understand it from context there as well. Septuples can be confusing, and many people mistakenly would write, say, a septuple over a half note with double beams because each note's duration is so close to a 16th note.